Veneers are thin shells that are typically made from a tooth-colored material, like porcelain. The porcelain material is extremely strong, resists scratches and doesn’t stain like your natural teeth. They are applied to the front part of a tooth to improve the appearance of your smile. Dental veneers offer a simple way to change the appearance of one tooth or all of them. 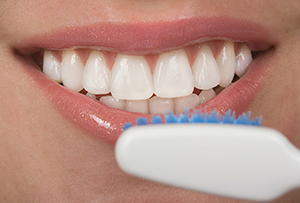 Dr. Selena L. Marchan, your Jacksonville, FL, dentist, share some information about veneers. Eating and drinking brightly colored foods, such as coffee, tea, wine, cola, popsicles, and berries can stain your teeth. Although teeth whitening can improve the appearance of your smile, the results must be touched up occasionally, and whitening may not lighten your teeth quite as much as you expected. Veneers provide long-lasting results and allow you to choose the shade of white you prefer. After your initial consultation, you'll only need to return to the dentist's office twice to receive your new veneers. During the first appointment, your dentist will file the front of your tooth slightly. This step is essential and ensures that your veneer doesn't feel bulky. After your tooth is filed, your dentist makes an impression of your teeth. A dental laboratory uses the impression to create a veneer that will fit your tooth perfectly. It usually takes about two to three weeks to create veneers. Until it's ready, you'll wear temporary veneers. When your new veneers arrive, you'll return to the office. Your dentist will attach the veneer and check the fit. After any necessary adjustments are made, your veneer will be permanently attached to your teeth with dental cement and cured with a special light. Are you interested in freshening up your smile?